Rich and intense, this is the new release of the Jura distillery named Turas Mara ("long journey" in Gaelic). The Jura distillery has always been inspired by its Island history: Turas Mara, meaning "long journey" in Gaelic, refers to the long migration periods in the 18th and 19th century when the Diurachs (Jura's inhabitants) had to leave to find work abroad, in Canada or the United States. A poem of Jessie Scott, a Diurach poet, expresses his sorrow and distress at the idea of leaving his island behind never to see it again. Like the inhabitants of Jura kept the spirit of their island while leaving for faraway countries, Turas Maras features flavours of distant lands while being intensely Diurach. This expression is a blend of four different casks: Kentucky Bourbon, Spanish Sherry, French oak and Port casks. Some say Isle of Jura is the oldest distillery of Scotland. Indeed, the first traces of distillation hark back to the 16th century. The distillery was renamed several times. It successively bore the name of Caol'nan Eilean, Craighouse, Small Isles and Lagg. Built in 1810, the first to obtain a license to distil is William Abercrombie, in 1831. In the following year, Archibald Fletcher took over the distillery and managed for 20 years. It changed owner many times in the 19th century: J&A Gardner, Norman Buchanan, J.K. & D. Orr and James Furgusson. As the landlord decided to collect taxes on the land, the Furgusson family moved all the equipment to Glasgow. This did not deter the landlord to pursue the Furgusson’s who came back to the Isle of Jura and dismantled the distillery’s roofs. Indeed, law exempted all roofless structures from taxation. More recently, after 40 years of closure between 1914 and 1948, the distillery was fully rebuilt with financial support from Scottish & Newcastle Breweries. The architect who rebuilt the distillery is well known in the whisky world, as it is Delmé Evans, who also rebuilt, amongst others, the Glenallachie and Tullibardine distilleries. The Scottish & Newcastle Breweries sold the distillery to Invergordon, which was purchased by White & Mackay and became in 2001 Kyndal Spirits. The Kyndal Spirits became in 2003 Whyte & Mackay Ltd. The distillery is one of the flagships of Whyte & Mackay. The wide and tall stills of the distillery have been conceived to produce a light distillate, enabling Isle of Jura to contribute to the Whyte & Mackay blends. 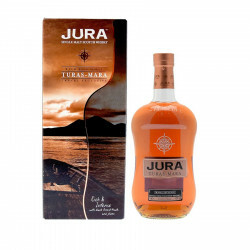 The range has considerably expanded these last few years also with the creation of peated versions of Jura whisky. Nose: intense, rich and packed with fruits, plums, ripe cherries, sultanas and spices. Palate: velevety texture with a pleasant sweetness at the fore, followed with tanins and spicy pepper. A drop of water brings out vanilla flavours and dark cherry jam. Finale: pleasantly sweet, with an inkling of almond in the end.